Word/quote of the month: "Just do it"
So, I may have stolen this off a well-known sports brand, but it definitely feels an appropriate misappropriation for this month. There are lots of occasions in life where you feel hesitant or reticent - but sometimes (read: all the time) it can be life-enhancing to ignore the natural fear - and just do it. This month I have embraced this motto in many parts of my life - both personally and in my work/study life - and it has been working for me. Not every occasion where I have 'just done it' has worked out the way I thought, or been successful - but I would much rather have tried and 'just done it', than not. So, if I could make a prescription to you - try saying "just do it" to yourself a bit more than, "what if...". It's highly recommended. Healthy/meal food of the month: Homemade smoothies/juices. I have been getting back into the habit of making a quick smoothie in the morning. I pack mine with goodies like spinach, oats, bananas, a green powder and then whizz up with some orange juice and a splash of dairy-free milk. This makes sure that I never miss breakfast on days where I am up too early to eat or am rushing from place to place. I'm not one of those people who can go without food, but I struggle to eat a lot really early in the morning before leaving for uni/work. I am also hopeless without a full stomach, so I always have something mid-morning if I've only had a smoothie to start. I may do a blog-post on my favourite smoothie recipes, so if that's something you want to read - let me know. Lesson of the month: It's never good to avoid or suppress things. It's sometimes only when people who know you ask "how are you?" and want to know the true answer that you realise you haven't asked yourself that, or been making sure you are okay. There have been highs and lows this month - my last ever hospital appointment being an example of both. What I think is important is that, especially when you are going through a period of significant life change or dealing with difficulties (like I currently am) - it's important to allow yourself to process all of that. It doesn't help you or anyone to just keep going and pretending nothing is happening. Or distracting yourself with other people's problems, and ignoring your own. Confronting an issue, or an obstacle is really healthy and means that you can hopefully reach a resolution and some inner peace. Self-compassion is key - and learning to allow yourself to grieve, get angry, cry, shout, stomp your feet, laugh hysterically or all the above is vital. I also think it can send a really positive message to yourself if you recognise that your emotions matter just as much as other peoples. If you are feeling upset, it isn't silly - as I found myself saying to a couple of friends today. It's important to care for yourself and not devalue your reactions to things. Healthy thing(s) to do: Being honest, congruent and bold. Being honest (to the best of your ability) with yourself and others is one of life's essentials - for me anyway. Telling the truth, and confronting the reality of life can feel scary, and sometimes you have to be brave and just be honest (see a parallel above with my quote of the month...). There's nothing worse than being lied to or lying to yourself. Being congruent creates peace and harmony, not only within yourself, but in your relationships with others. Being bold feels freeing and empowering - feelings that are pretty magical in combination. Goal for the next month: Feel more centred, do some more exercise and keep on being bold. How has January gone for you? What are your goals for February? Set up after 11 years of personal experience of illness, Life In Recovery was created to help people who are still suffering with, have recently suffered from or who know individuals dealing with long term conditions and illnesses. The resources are aimed at providing insights and aiding recovery, engagement, empowerment and integration into the wider world during and after ill health. Created by a holistic healthcare advocate (who is now on the road to recovery) who regularly makes films and writes posts on a number of different topics; all centred around maintaining good health and navigating recovery from, or life with, a chronic illness. 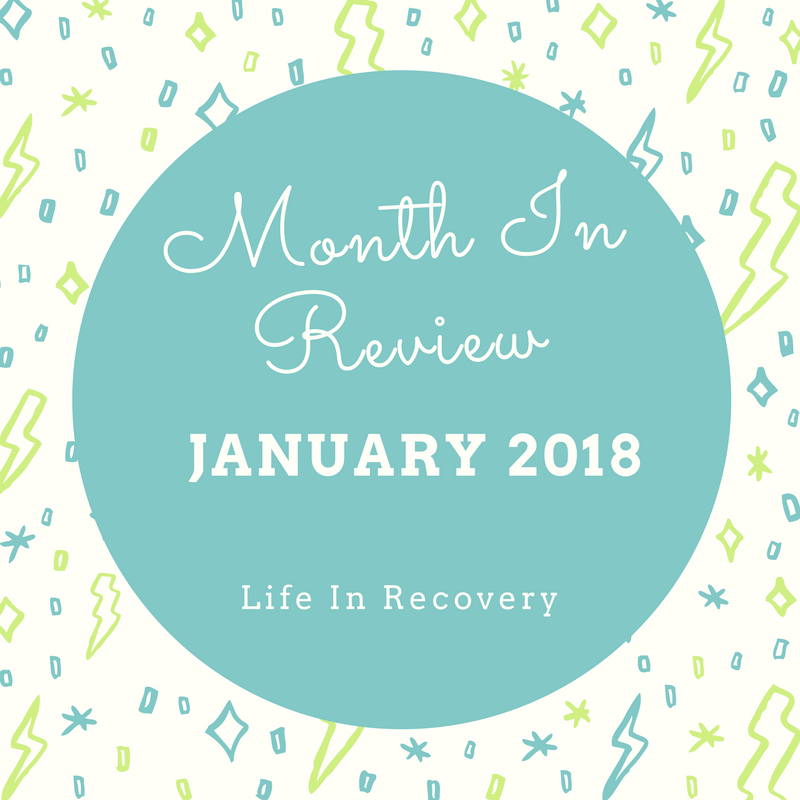 Life In Recovery. Theme images by andynwt. Powered by Blogger.